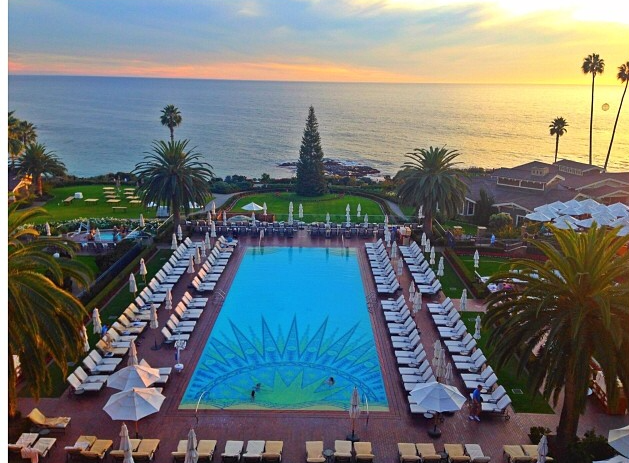 One of my favorite places in the world is the Montage Laguna Beach. This five star luxury hotel is just a drive away from Los Angeles, but it feels like you are light years away from all the crazy LA streets and traffic. I call it a “staycation” at its finest. It is so peaceful and relaxing there. The hotel itself is gorgeous. I love the decor- it’s contemporary beach chic, but feels elegant and luxurious. I’ve stayed in 2 bedroom & 1 bedroom ocean view suites, as well as a standard room, and all are very nice. The Montage is definitely on the pricey side, but it’s worth the splurge if you have the money to spend. I wanted to share some of my favorite parts about the Montage. Below are bits and pieces of my experiences at different times. I look forward to this for breakfast every time I go. The montage has a bakery on the grounds, and all their breads & pastries are made fresh. I usually eat it in bed or on the ocean view balcony in the morning when I wake up. If you prefer not to order breakfast to your room, there are other breakfast options at the hotel. You can have breakfast by the pool, at Studio restaurant or at the Loft. The Loft has a great breakfast with a large variety of options as well. The Loft is a restaurant inside the hotel. Located on the 4th floor of the hotel, the restaurant serves breakfast, lunch & dinner with panoramic views of the Pacific Ocean. It has a cheese bar which features a wide variety of international cheeses. The cheeses are displayed along side farmers market fruits, local honeys, house made jelly & condiments, nuts, crackers & fresh baked bread. It’s an impressive display and also fun to design your own cheese plate to your liking.